Kargil: Kargil town of Ladakh division Friday observed a complete shutdown against the Government of India’s reluctance to throw Kargil-Skardu road open for the public. The call for shutdown was forwarded by Anjuman Jamiyat Ulma Isna Ashriya (AJUIAK). Reports said that all the shops and business establishments remained shut while transport also remained off the roads. Pertinently, last week the town witnessed massive protest march that was carried out to press for the demand of opening of the cross LoC Kargil- Skardu Road to help families divided in 1947 due to partition to meet and interact freely. According to reports some 12,000 to 15,000 divided families in Ladakh. 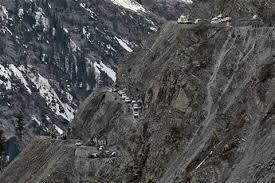 AJUIAK requested Government of India to open Kargil-Skardu Road and Turtuk-Khapulo Road on humanitarian basis.